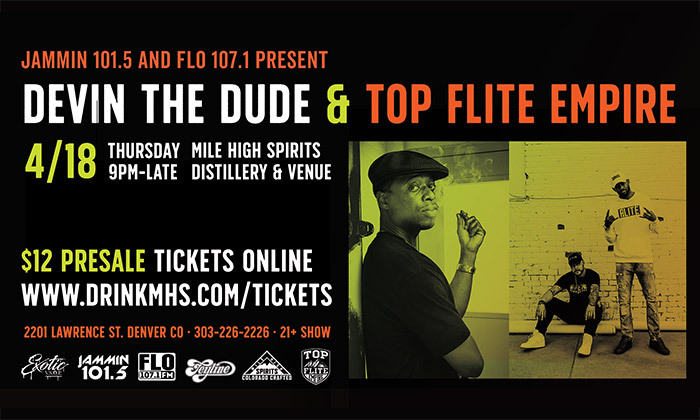 Presented by Jammin' 101.5, FLO 107.1 & Exotic VSOP Cannabis , Devin The Dude and Top Flite Empire are teaming up to kick things off on a high note in our #TastingRoom on Thursday, April 18th at 9PM. With Feyline, 3 Deep Productions and Mile High Spirits Block Party all teaming up for this throwdown, this is going to be a rager you don't want to miss. Limited $12 early bird tickets are available now with $15 GA tickets up for grabs when those are gone. Get yours now!